Children need to be active for optimal health, but many are leading sedentary lifestyles due to TV, computers, video games and the lack of physical education in many schools. You can swap your child's TV time for a fun 60 minutes of physical activity every day and help to protect them from childhood obesity, high-blood pressure, type 2 diabetes and high cholesterol, according to The American Heart Association. Workouts for children should meet the needs of their developmental stage, notes the American Council on Exercise. Always check with your child's doctor prior to beginning any new fitness program. 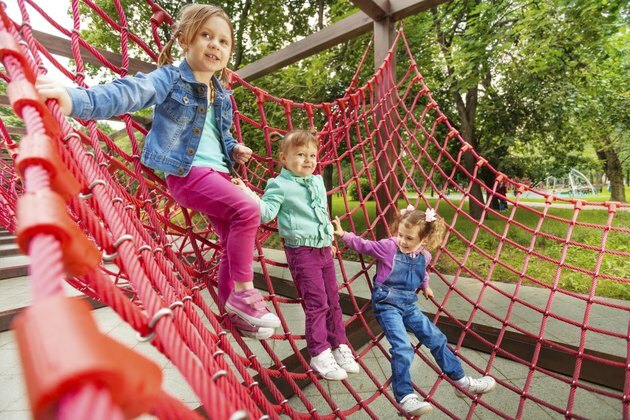 Kids love fun, and obstacle courses are a creative way to get them motivated and moving. Obstacle courses are simple to set up at home, the park, the playground or the beach, and you can use a variety of things as equipment. Get creative and use toys in the closet, stuffed animals, soccer balls, footballs, jump ropes, soup cans and old dish rags to set up as the obstacles. Make each obstacle fun and challenging and keep the game going for 15 to 30 minutes. After you come up with a few courses have the children make up a few and participate with them. Strength training with light weights and body resistance exercise is effective and safe for almost all healthy children. Strength training promotes healthy bone growth, improves self-confidence and improves muscular fitness and motor fitness performance, according to the American Council on Exercise. Equipment such as light medicine balls, resistance bands or tubing or light dumbbells are easy and fun for children to use. When children are working out with weights for strength training, it is important to ensure that all major muscle groups are worked equally in a balanced, full-body workout. It is recommended to talk to your child's doctor prior to beginning a strength training program and to have a certified personal trainer help to set up a customized program. Follow the leader is a fun way to involve the whole family in fitness and set a good example. You can do this workout anywhere, inside, outside, at home, a park or the beach, and no equipment is needed. Begin with slow movement such as marching or walking with silly arms and hands for five to eight minutes. Next, move into the active phase of faster, bigger movement, such as kicks, punches, jumps and sprints for 15 to 30 minutes. Follow this with movements that utilize body resistance, such as leap frog, burpees, push-ups and sit-ups for five to 10 minutes. Then, end with a cool-down and stretch. Have the children follow you as the leader for most of the movements and then switch off and have them come up with some on their own.